Office field work is a rare occasion for me so it was a refreshing break from desk work to go to an exhibit in Megamall. The exhibit was called the One Town, One Product Exhibit or O.T.O.P. for short. This project was one of the initiatives of the former President Gloria Macapagal Arroyo. The goal of this project is to provide livelihood for all the regions producing different products and to highlight each region's unique produce or craft. On the other hand, our goal for this outing was to take a look at the possible business opportunities. But being foodie lovers that we are, me and my friend and colleague did not pass up the chance to taste the different food finds from each region. There were lots of delicious stuff which were really affordable. Some of them made us wish they were readily available online or in malls. Our first food item was the empanada with Vigan sausages and egg inside. The cook just arranged the sliced sausages in a circle and then broke one egg and placed it on the center of the dough. It was folded in half and then it went straight to the frying pan. It was that fresh! The empanadas were huge and it was a huge success too as people were lining up and patiently waiting for their turn. Not to mention, it was cheap at only P50.00. The dough was orange in color so I'm not sure if this was just plain dough with food coloring or if it was made from pumpkin. The empanadas were served to us wrapped in plastic and then in a paper bag with a container of vinegar sauce inside. We had to carry them with us while we looked at other delicacies because it was too hot to eat. We finally got to taste it when we settled on another food kiosk. So while we waited for our next food find to be served, we were savoring this one and it was delicious. The sausage was flavorful and the egg was a good companion to the salty-sweet taste of the sausage. Add to that the special vinegar sauce and it was doubly delicious! The vinegar was sour and sweet at the same time with a hint of garlic and a kick of spiciness to it. Yum, yum.
" "PANSI" is the Ybanag translation of the tagalog word PANCIT that means cooked noodles, the "MIKI" is the Ybanag term for uncooked noodles." So the uncooked noodles looked like your ordinary noodles, just plain pale yellow and thin. It didn't look anything special but we had to taste to confirm, so we dug right in. We were quite surprised that it tasted good but like I said before, nothing special really. It tasted just like most home-cooked noodles which had soy sauce in it. However, the crispy pork bits, carrot slices and sliced quail eggs gave it a rich texture and another layer of flavor. But our hunch was right, it was good for 2-3 persons at least because after a while, we we're losing the desire to eat some more. One thing we didn't like about this was that the sauce was dripping every time you scooped up some of the noodles with your fork. Maybe this contributed to the noodles being soggy and saturating our tongue with the strong flavor resulting in umay. Still we did not want to waste good food, so we tried our best to finish it off and we did with only a teeny little bit left over. This was also thanks to the calamansi which neutralized the strong flavors. Our next stop was at a kiosk which served dishes made from mushrooms. I'm ashamed to say that I don't remember the region for this particular kiosk but I'm pretty glad I got to see the mushroom delicacies. There were several that caught our hungry eyes: the mushroom burger patties, the mushroom mini empanadas and the mushroom siomai. As we already indulged in some carbs with the noodles before, we decided to go for the mushroom empanadas and siomai. The empanada had sweet chili sauce on it while the siomai had soy sauce on it and they were both tasty for a mushroom dish. Mushrooms by themselves have very little taste (especially the ones in a can) but I guess the spices they added to these two is the secret to their flavor. Or they could have used a mushroom with stronger flavors when cooked? If this is true, I would like to learn to cook a dish with that kind of mushroom. Oh and look! Their mushroom siomai have these on their bottoms, which we found really cute. Aside from this being tasty, it's also good to know that there are healthier versions of these two popular food items. I wanted to get myself a bag of these but I didn't want to carry them with me since we wanted to go look at other kiosks. In the end, I forgot to buy any mushroom food stuff (sigh). Although the exhibit mostly had food stuff, there were also furniture, arts and crafts items, fashion accessories, shoes and bags and even coconut shell lights. There were also wines and other organic food products. I must say though that the O.T.O.P. theme was not really followed. 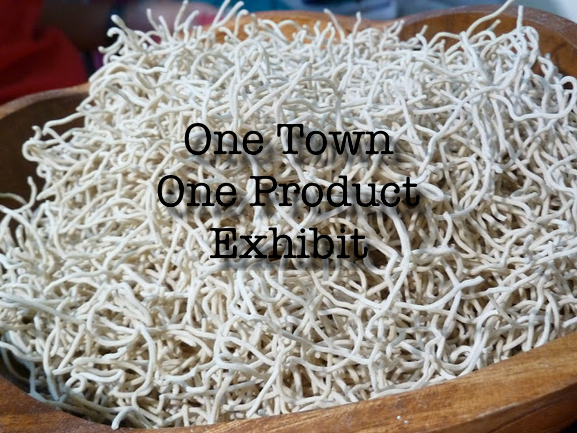 There were a lot of similar products from different regions. One big example of this is that most regions had their own version of longganisa and many manufacturers from different regions also sold furtniture and even shoes. Maybe this project still needs more planning.